After 2 years of waiting, UFHO2 is here. If you like strategy and challenges, UFHO2 will put your brain to the test. In UFHO2, you play a jelly alien trying to get as many gems as possible while moving about in a maze-like UFO. Play turn-based matches against smart opponents, and use your brain to outwit them and get the upper hand. UFHO2 is strategy at its finest, packed in a competitive board game. In this sequel, things get bigger and better in every way, with new stages, more board layouts, all new characters, new game modes, and more powerups, leaderboards and achievements. What more can you ask for? • Situations mode — once you’ve become really good, show your worth in these super-hard matches! • GameCenter support on iOS, with 24 Achievements and 2 Leaderboards shared between iOS and OSX - be the best in the world! • Play up to 4 on one device/computer! UFHO2 on sale and getting to new platforms! Hey everyone, it's been a long time, hasn't it? First things first: UFHO2 is on sale pretty much anywhere, at 50% discount. Finally, I was able to resume working on UFHO2 a little. As a first thing, I wanted to expand the number of platforms UFHO2 is on, so I'm happy to announce that on iOS, UFHO2 is going Universal! Version 1.4 has been sent to Apple right recently, and it is in review... expect it to be out in a few days. This means that if you own it for iPad, you own it for the iPhone, and viceversa! The game is going to look beautiful on the new iPhones, since it was originally made for the retina iPad so everything will be crisp and hi-res, don't worry!Version 1.4 has been sent to Apple right recently, and it is in review... expect it to be out in a few days. Get it on the AppStore here! Also, check out the new video (this is how the game will look on an iPhone 6+) here or on YouTube. Also, UFHO2 is soon coming out on Android through Google Play! For mobiles and tablets, though I'm capping the screen size to large/extra large* because you know, playing UFHO2 needs a bit of space and resolution, otherwise you won't play it properly! * I'm not sure about the inches values, it probably depends more on the pixel-per-inch value. But don't worry: Google Play blocks you before purchasing a game if it's not compatible with your device! So, if you don't own an iPad but you have an Android device... soon you will have the chance to play the game there! UFHO2 is on Desura Alphafunding! 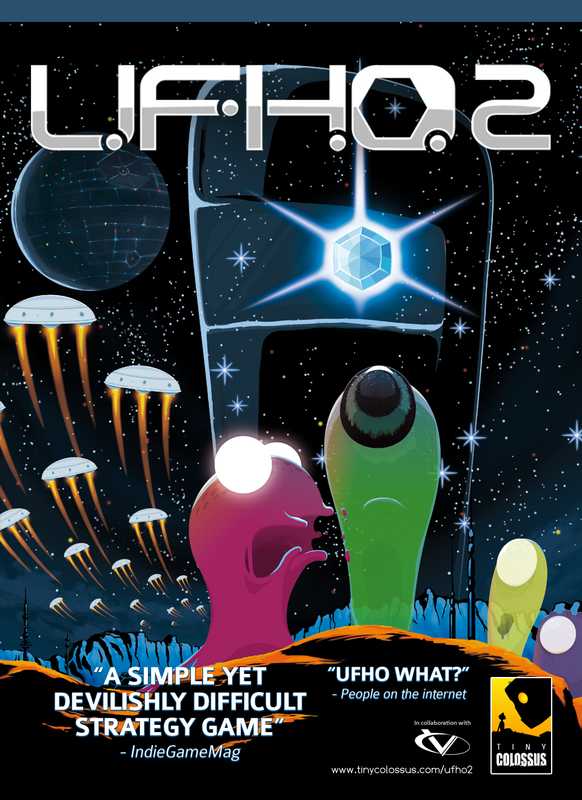 After a long wait, UFHO2 is finally available on Desura Alphafunding at 40% off the regular price. We created a new "finished" build to submit to the IGF, which is also going to be sent to our backers as a new alpha version. We're sending ALPHA versions to our backers of the KS campaign. A closed BETA will also come reasonably soon. Expect news and a release date very very soon! This game is utterly fun and I cannot wait to play the full version! Special thanks to Vinnie Jr, who regularly helps me review board games. Wow! Had to give to this little gem a 10/10! Great game and very inspiring! Really enjoyed the graphics, it sets you in a great atmosphere. Also digging the gameplay a lot, I like how you have to use your brain to get the full game experience out of it. 10/10 deserved, cause there's not so many other indie games out there with such an original concept, deep ambience and polished work! Great stuff, and looking forward for the complete version!! Kudos! Why is this not in the Alpha fund section? Well, anyway I just wanted to comment on the graphics. They are pretty nice, and likeable. The good graphics and teh unique gameplay make me want to buy this game. I even feel that the price is fair. Well done. I usually do not give good reviews to alpha games, this one is truely a gem. I will wait until it is either in a bundle or on sale, I am more of an FPS and Block building game type of guy. I would probably only play it until I learned the basics of the game before i moved on to something else. Hope to see you guys do well with this title. It is a true gem in a sea of poorly developed indie turds. Hope you guys help raise the bar on "Indie" quality. Maybe I'm going to put up a demo as soon as I have something juicy, so you and the others can check if it's good enough to buy.